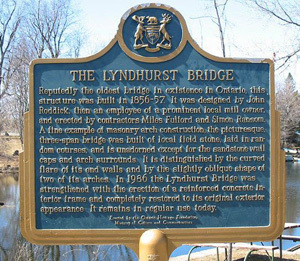 According to general belief the Lyndhurst Bridge is said to be the oldest bridge in existence in Ontario. Built in 1856-57, it was designed by John Roddick. He was an employee of a prominent local mill owner at the time. 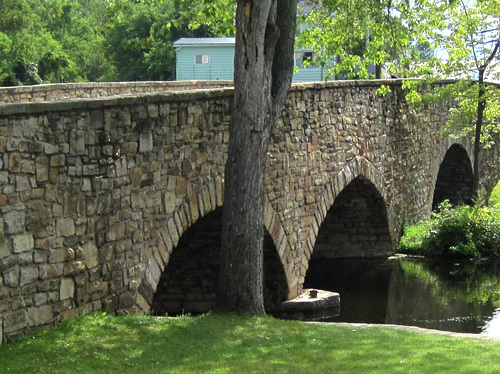 This bridge is a fine example of masonry arch construction, the picturesque three-span bridge was built of local field stone, laid in random courses, and is unadorned except for the sandstone wall caps and arch surrounds. In 1986 the Lyndhurst Bridge was strengthened with the raising of a reinforced concrete interior frame and completely restored to its original exterior appearance. 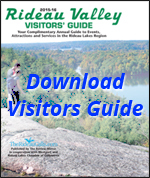 It remains in regular use today. Reputedly the oldest bridge in existence in Ontario, this structure was built in 1856-57. It was designed by John Roddick, then an employee of a prominent local mill owner and erected by contractors Miles Fulford and Simon Ransom. A fine example of masonry arch construction, the picturesque three-span bridge was built of local field stone, laid in random courses, and is unadorned except for the sandstone wall caps and arch surrounds. It is distinguished by the curved flare of its wend walls and by the slightly oblique shape of two of its arches. In 1986 the Lyndhurst Bridge was strengthened with the erection of a reinforced concrete interior frame and completely restored to its original exterior appearance. It remains in regular use today.